Please be sure to CALL US for information on how to measure existing doors for replacements. 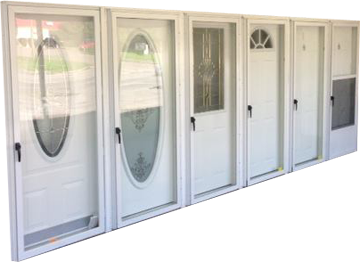 We offer a wide range of Combo Doors from your basic mobile home door with a diamond window to the higher-end six panel steel door with storm door. We offer a classy look with the mobile home outswing Exterior French Door. 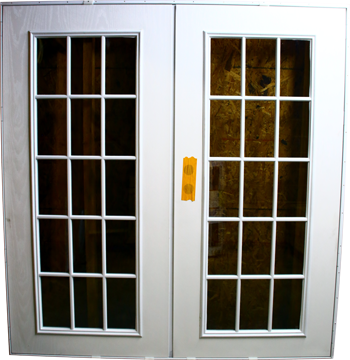 We keep a good inventory and wide selection of the most popular Patio Doors. 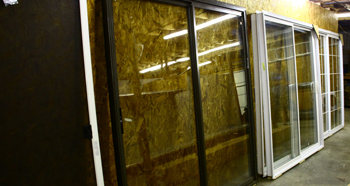 From the basic single pane to the higher-end thermo pane, energy efficient doors. 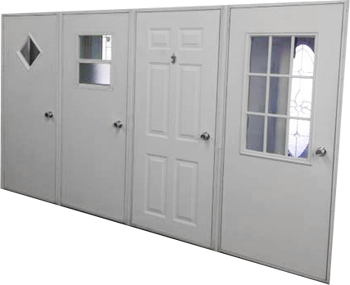 We have in stock, several types of interior door to choose from. These doors range in many different sizes so please be sure to measure your door (width & Height) before coming in. We have the basic Valley Oak Door, smooth on both sides, the flushed white also smooth on both sides and the white six panel molded. The widths come as follows: 24", 26", 28", 30", 32", 36"
We offer two different heights: 78" & 80"
We offer a large variety of replacement windows from the basic aluminum sliders to the top of the line Vinyl, Tilt In replacement sliders. These windows come in many, many sizes, so please give us a call and let us guide you in the correct way to get a accurate measurement. Can I buy my door locks at other building suppliers? No...The Mobile Home type doors are made totally different from the regular residential type doors. Therefore, other locks will not properly work on your doors. We offer a large variety of door locks, window locks & and storm door locks. We also have a large variety of hardware.